이동통신 단말기를 이용하여 긴급 상황을 제3자에게 알릴 수 있도록 하는 긴급 호출 시스템 및 그 제어 방법에 관한 것이다. It relates to an emergency call system, and a control method that enables to inform the emergency situation to another party using the mobile communication terminal. 긴급 호출 시스템은 적어도 하나의 피호출 단말기와 미리 등록된 가입자의 긴급 상황을 감지하면 긴급 상황 신고센터에 알리는 관리 서버와 긴급 상황을 알리기 위한 메시지, 적어도 하나의 피호출 단말기(수신처) 전화번호, 가입자의 전화번호, 가입자의 관리 서버 등록 아이디, 및 기지국 식별 정보를 포함하는 제1긴급 메시지와, 긴급 상황을 알리기 위한 메시지, 가입자의 전화번호 및 기지국 식별 정보를 포함하는 제2긴급 메시지를 만들어 송신하는 호출 단말기와 제1 및 제2긴급 메시지를 수신하여 관리 서버와 피호출 단말기에 각각 전달하는 기지국을 포함한다. Emergency call system includes at least one called terminal, and if it detects an emergency situation of pre-registered subscriber a message for notifying the management server and the emergency notifying the emergency call center, and at least one called terminal (destination) phone number, subscriber telephone number, to transmit to create a second emergency message including the subscriber of the management server registration ID, and the first emergency message, and a message to inform the emergency situation, the subscriber of the telephone number, and base station identification information including base station identification information It receives the call terminal and the first and second emergency message includes a base station for each transmitted to the management server and the called terminal. 본 발명은 이동통신 시스템 및 호출 제어 방법에 관한 것으로, 특히 이동통신 단말기를 이용하여 긴급 상황을 제3자에게 알릴 수 있도록 하는 긴급 호출 시스템 및 그 제어 방법에 관한 것이다. The present invention relates to an emergency call system, and a control method that enables to inform the emergency situation to a third party using, and more particularly a mobile communication terminal on the mobile communication system and a call control method. 이동통신 단말기를 사용하는 사용자가 긴급한 상황(예: 교통사고, 화재, 강도 침입 및 폭력배 등)을 만나 누군가에 도움을 청해야 할 상황에 처하게 되면, 직접 누군가에게 호 연결을 시도하여 통화로가 연결될 경우 현재 자신의 상황과 위치를 말하여 도움을 요청해야한다. Users have an emergency to use the mobile terminal: If the meeting (for example, a traffic accident, fire, burglary breaking and gangs, etc.) to put the situation to ask for help to anyone, and to call connects to try to direct someone call connection If you need assistance now and the end of their situations and locations. 만약 호 연결에 실패하게 된다면 다른 연락처를 찾아보아야 하므로 적절한 시기에 도움을 요청하지 못하는 경우도 있다. If it fails, the call connection may fail to seek help at the right time so should find another contact. 또한 강도가 침입을 했거나 폭력배를 만나 가해자와 직접 대면하고 있는 상황에서는 호를 연결하여 도움을 청하는 것은 거의 불가능하다. In addition, it has the strength or the breaking in to meet the gang situation in which face-to-face contact with the offender to connect a call for help is almost impossible. 만약 사용자가 이동통신 사업자가 제공하는 서비스에 가입 한 경우에는 긴급상황에 처했을 때 이동통신 사업자에게 긴급 구조 요청을 하면 가입자가 미리 지정해 놓은 연락처로 가입자의 현재 위치 정보나 현재 상황을 판단 할 수 있는 사진 또는 동영상 정보를 제공하고 긴급 구조 요청을 수신한 사람들과 통화를 연결하도록 하는 방법 등이 이용되고 있다. If you subscribe to the service provided by the mobile operators there when the emergency request to the mobile operators when put to an emergency situation in which the subscriber is able to judge in advance given contact as the current position information and current status of the subscriber Place such as how to provide photos or video information, and connect the call to the people receiving the emergency request is being used. 그러나 긴급한 상황에서 여러 사람들에게 직접 호를 연결해야 한다는 점은 마찬가지이다. But the point is that the same should be connected directly to the call to multiple people in an emergency. 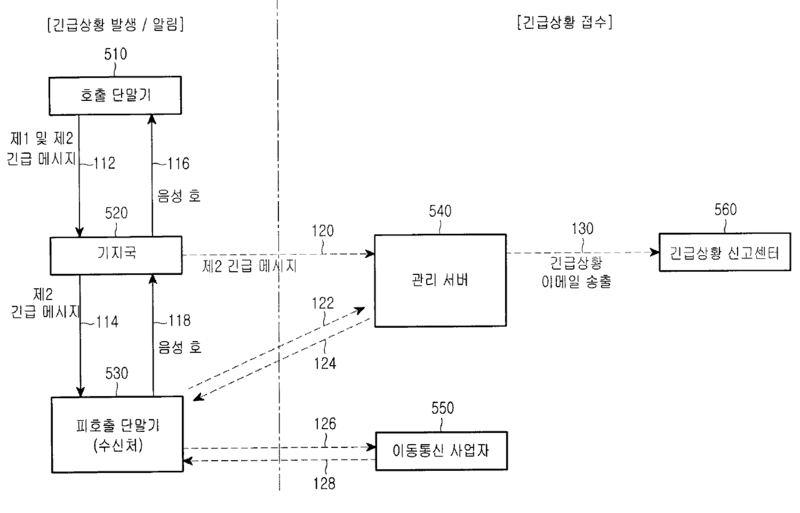 또한 위험에 처한 사용자의 위치 정보나 현재 상황을 알리기 위하여 GPS(Global Positioning System) 수신기와 같은 위치 추적 시스템 등을 이용하여 사용자의 현재 위치를 추적하여 수신처에 알린다거나 동영상 사진을 찍어 보내는 등의 서비스는 GPS 수신 기능이 있거나 사진 촬영이 가 능한 이동통신 단말기를 별로도 구입하여야만 사용이 가능하다는 제약이 있다. In addition, services such as tracking your current location using a location tracking system such as (Global Positioning System) GPS receiver to inform the user of the location or the current situation in risk informs the recipient or sending take video pictures there are GPS reception function, or pictures taken using the constraints that this is hayeoyaman also purchased by the mobile communication terminal can be possible. 또한 위치정보의 제공이나 동영상 및 사진 정보의 제공은 대부분 이동통신 사업자에 따라 달리 구현되는 사항으로 서로 다른 이동통신망에 가입한 사용자에게는 전달하지 못하고, 같은 이동통신 사업자에 가입한 사용자에게만 서비스가 가능하다는 문제점이 있다. In addition, that provision of the offer or the video and photo information of the location information does not pass for registered users in different mobile networks in locations that are implemented differently depending on many mobile operators, the service is only available to registered users on the same mobile operator there is a problem. 또한 긴급 상황을 알려주는 메시지를 수신한다 하더라도 경찰서나 소방서와 같은 실질적으로 긴급 상황을 신속하게 효과적으로 처리할 수 있는 기관으로의 연계 방안이 없다는 문제점도 있다. In addition to receiving a message indicating an emergency situation, even if there are practically no problems of linkages with institutions that can effectively expedite an emergency situation, such as police or fire department. 따라서 본 발명의 목적은 이동통신 단말기 사용자가 긴급한 상황에 처해 있을 경우 자신의 상황을 알리고 구조를 요청하기 위해 원터치로 단문메시지를 전송할 수 있도록 하는 긴급 호출 시스템 및 방법을 제공함에 있다. It is therefore an object of the present invention to provide an emergency call system and method that allows the transfer of a short message in one touch to request structure inform their situation if there is a mobile terminal user are at an emergency to provide. 본 발명의 다른 목적은 다수의 수신처로 긴급 메시지를 한번에 전송할 수 있는 긴급 호출 시스템 및 그 제어 방법을 제공함에 있다. Another object of the present invention is to provide an emergency call system, and a control method for transferring emergency messages to a plurality of destinations at a time. 본 발명의 또 다른 목적은 이동통신 사업자의 서비스 가입이나 종류에 상관없이 이동통신 단말기만으로 긴급 호출을 할 수 있는 시스템 및 그 제어 방법을 제공함에 있다. A further object of the present invention to provide a system and a control method capable of an emergency call only the mobile terminal regardless of the subscription or the type of service of the network operator. 본 발명의 또 다른 목적은 긴급 호출을 한 이동통신 단말기 사용자가 음성 통화가 불가능한 상황에서도 상기 긴급 상황을 감지한 수신처에서 호 연결을 시도 하여 현재 상황을 보다 정확하고 안전하게 파악할 수 있도록 긴급 호출 시스템 및 그 제어 방법을 제공함에 있다. It is another object of the present invention, an emergency call system and ensure that a mobile device user an urgent call to identify even under non-voice calls by trying the call connection from the destination detects the emergency safely and more accurately the current situation It is a control method to provide. 본 발명의 또 다른 목적은 긴급 상황에 처한 가입자가 긴급 호출만 하면 경찰서나 소방서와 같은 긴급 상황 처리 기관으로의 연계가 자동으로 이루어지는 긴급 호출 시스템 및 그 제어 방법을 제공함에 있다. A further object of the present invention is simply a subscriber emergency call facing an emergency is to provide an emergency call system, and a control method automatically made of the association of the emergency agencies, such as police or fire department treatment. 상기한 목적을 달성하기 위한 본 제1발명은 긴급 호출 시스템이 적어도 하나 이상의 피호출 단말기와; And this for achieving the above objects is the first aspect of the invention is an emergency call system at least one called terminal; 미리 등록된 가입자의 긴급 상황을 감지하면 긴급 상황 신고센터에 알리는 관리 서버와; If it detects emergency situations of pre-registered subscribers and the management server notifies an emergency call center; 긴급 상황을 알리기 위한 메시지, 적어도 하나 이상의 피호출 단말기(수신처) 전화번호, 상기 가입자의 전화번호, 상기 가입자의 관리 서버 등록 아이디, 및 기지국 식별 정보를 포함하는 제1긴급 메시지와, 긴급 상황을 알리기 위한 메시지, 전화번호, 및 기지국 식별 정보를 포함하는 제2긴급 메시지를 만들어 송신하는 호출 단말기와; Message to inform the emergency situations, at least one called terminal (destination) number, the subscriber telephone number, a first urgent message including the management server, registration ID, and base station identification information of the subscriber, and notify the emergency the calls made to send the second terminal for emergency messages, including messages, phone number, and base station identification information; 상기 제1 및 제2긴급 메시지를 수신하여 상기 관리 서버와 상기 피호출 단말기에 각각 전달하는 기지국을 포함함을 특징으로 한다. It characterized in that for receiving the first and second emergency message including a base station for each transmitted to the management server and the called terminal. 상기한 목적을 달성하기 위한 본 제2발명은 호출 단말기, 피호출 단말기, 미리 등록된 가입자의 긴급 상황을 감지하면 긴급 상황 신고센터에 알리는 관리 서버, 및 기지국을 구비한 긴급 호출 시스템에서 긴급 호출을 제어하는 방법에 있어서; The above object of the second invention is called terminal, the called for achieving the terminal, when detecting an emergency situation of the previously registered subscriber emergency call from the emergency call system having a management server, and the base station notifies the emergency report center a method for controlling; 상기 호출 단말기가 긴급 상황 알림 키 입력을 감지하면, 긴급 상황을 알리기 위한 메시지, 적어도 하나 이상의 피호출 단말기(수신처) 전화번호, 상기 가입자의 전화번호, 상기 가입자의 관리 서버 등록 아이디, 및 기지국 식별 정보를 포함하는 제1긴급 메시지와, 긴급 상황을 알리기 위한 메시지, 상기 가입자의 전화번호, 및 기지국 식별 정보를 포함하는 제2긴급 메시지를 만들어 송신하는 제1과정과; When the calling terminal detects an emergency notification key input, message to inform the emergency situations, at least one called terminal (destination) number, the subscriber telephone number, of the subscriber management server, registration ID, and base station identification information a first step of the emergency message, the message for informing the emergency situation, creating a second message including the emergency telephone number of the subscriber, and base station identification information transmission comprising and; 상기 기지국이 상기 제1 및 제2긴급 메시지를 수신하면 모드를 체크하는 제2과정과; A second step of the base station checks the first and the second mode and upon receipt of the emergency message; 상기 모드 체크결과, 지정호출 모드이면 상기 피호출 단말기에만 상기 제2긴급 메시지를 송신하고, 긴급구조 모드이면 상기 피호출 단말기에는 상기 제2긴급 메시지를 송신하고 상기 관리 서버에는 상기 제1긴급 메시지를 송신하는 제3과정으로 이루어짐을 특징으로 한다. The mode check result, if the designated call-mode when the called terminal only the second transmit an emergency message, the emergency mode, the called terminal has transmitted the second emergency message, and the first emergency message and the management server, It characterized by a third constituted by any process of transmission. 이하 본 발명의 바람직한 실시 예를 첨부한 도면을 참조하여 상세히 설명한다. With reference to the accompanying drawings a preferred embodiment of the present invention will be described in detail. 우선 각 도면의 구성 요소들에 참조 부호를 부가함에 있어서, 동일한 구성 요소들에 한해서는 비록 다른 도면상에 표시되더라도 가능한 한 동일한 부호를 가지도록 하고 있음에 유의해야 한다. First, in addition as the reference numerals to components of each drawing, the same components hanhaeseoneun although shown in different drawings even if it should be noted that the so as to have the same reference numerals as much as possible. 하기 설명에서는 구체적인 전화번호 등과 같은 특정(特定) 사항들이 나타나고 있는데, 이는 본 발명의 보다 전반적인 이해를 돕기 위해서 제공된 것일 뿐 이러한 특정 사항들 없이도 본 발명이 실시될 수 있음은 이 기술 분야에서 통상의 지식을 가진 자에게는 자명하다 할 것이다. Illustrating the there appears to specific (特定), including specific telephone number, which is that the invention be as without these specific details provided can be carried out to assist the overall understanding of the present invention, ordinary skill in the art those with it will be obvious. 그리고 본 발명을 설명함에 있어, 관련된 공지 기능 혹은 구성에 대한 구체적인 설명이 본 발명의 요지를 불필요하게 흐릴 수 있다고 판단되는 경우 그 상세한 설명을 생략한다. And in the following description of the present invention, a detailed description of known functions and configurations that are determined to unnecessarily obscure the subject matter of the present invention, a detailed description thereof will be omitted. 도 1은 본 발명의 바람직한 실시예에 따른 긴급 호출 시스템의 구성을 나타내는 도면이다. 1 is a view showing the configuration of an emergency call system according to an embodiment of the present invention. 긴급 상황이 발생하여 가입자가 자신의 단말기- 호출 가입자의 단말기(이하 호출 단말기라 함. )- 510의 긴급 상황 알림용 키(이하 긴급 호출키라 함. )를 소정 방식으로 입력하면 긴급상황 알림용 단문메시지(이하 긴급 메시지라 함. )가 만들어져 기지국 520으로 송신된다(112). To an emergency subscriber has his terminal - terminal of the called party (hereinafter called a terminal box.) (Also called hereinafter emergency Kira) for emergency 510 alerts key to enter a predetermined way short message for an emergency alert message (hereinafter referred to as an emergency message) is created and transmitted to the base station 520 (112). 이때 메모리(도시되지 않음. )에 미리 저장되어 있던 정보를 이용하여 제1 및 제2긴급 메시지가 자동으로 만들어진다. The memory (not shown) for using information stored in advance the first and second emergency message is automatically created. 상기 정보에는 긴급 상황을 알리기 위한 메시지, 사용자 아이디(identification: 이하 ID라 함. )- 가입자가 긴급상황 관리 서버(이하 관리 서버라 함.) 540에 등록할 때 설정해둔 ID-, 적어도 하나 이상의 피호출 단말기 전화번호(수신처 리스트), 및 서빙(serving) 기지국 식별 정보 등이 있다. Said information message, the User ID to inform the emergency situation (identification:. Hereinafter referred to as ID) - P ID- set, at least one haedun when the subscriber is registered in the emergency management server (hereinafter referred to as management server) 540 called terminal has a telephone number (destination list), and the serving (serving) base station identification information. 기지국 520은 제1 및 제2긴급 메시지를 수신하고 이들을 각각 피호출 가입자의 단말기(이하 피호출 단말기라 함.) 530과 관리 서버 540으로 전달한다(114, 120). The base station 520 is the first and the second to receive urgent messages and pass them to the respective terminal of the called party (hereinafter referred to as a called terminal) 530 and the management server 540 (114, 120). 도시된 예에는 피호출 단말기 530이 하나만 표시되어 있으나 여러 개가 존재할 수 있다. The illustrated example, there may be present several dogs but the called terminal 530, only one is shown. 여기서 호출 가입자 혹은 피호출 가입자의 단말기는 예를 들어 휴대폰, 개인 휴대 단말기(Personal Data Assistant: PDA) 등을 말한다. Here the calling party or the called party terminal, for example mobile phone, a personal digital assistant: An (Personal Data Assistant PDA) or the like. 또한 기지국 520은 피호출 단말기 530으로부터 음성 호(voice call) 시도가 감지되면(118), 그 음성 호를 호출 단말기 510으로 전달한다(116). In addition, the base station 520 when a voice call (voice call), the attempt is detected from the called terminal 530 (118), and passes the voice call to the called terminal 510 (116). 상기 음성 호 시도는 피호출 가입자가 상기 호출 가입자의 긴급 상황을 접하고 전화를 걸어보는 경우를 말한다. The voice call attempts, says the call to see if the called party faces an emergency call of the subscriber. 관리 서버 540에는 가입자들로부터 제1긴급 메시지를 수신하기 위한 특정 전화번호가 할당되어 있다. The management server 540, there is a specific phone number for receiving a first emergency message allocated by the subscriber. 등록된 가입자의 긴급 상황을 긴급 메시지의 수신을 통해 감지하면 기지국 식별 정보를 이용하여 가입자의 위치 정보를 정확하게 계산하여 긴급상황 신고센터(이하 신고센터라 함.) 560 및 피호출자에게 알린다. If detected by the reception of the emergency message, the emergency situation of a registered subscriber by using the base station identification information of emergency report center to accurately calculate the position information of the subscriber (also referred to as call center) 560 and informs the called party. 이때 서버 등록 ID를 이용하여 사용자 인증을 실시한다. At this time, by using a server registration ID is performed for user authentication. 상기 알림은 이메일 송신으로 구현할 수 있다. The notification may be implemented by e-mail transmission. 반면에, 상기 이동통신 사업자 550은 상기 피호출 단말기 530으로부터 상기 호출 가입자의 위치 정보 요구가 수신되면(126), 상기 호출 가입자가 친구 찾기 서비스 등과 같이 가입자의 위치 정보를 알려주는 서비스에 등록된 가입자일 경우 상기 서비스 방식에 따라 상기 호출 가입자의 위치를 찾아 상기 피호출 단말기 530에 알려준다(128). Whereas on, registered with the service indicating location information of the subscriber, such as the mobile service provider 550 is the called terminal if the location information request of the called party received from 530 (126), the calling party to find friends subscribers If the response to the service plan, to find the location of the calling party informs the called terminal 530 (128). 도 2는 본 발명의 바람직한 실시예에 따른 호출 혹은 피호출 단말기의 구성을 나타낸 도면이다. 2 is a view showing the configuration of the calling or called terminal according to an embodiment of the present invention. 전술한 도 1에서는 호출 단말기 510과 피호출 단말기 530으로 구분하여 표시했는데, 이는 상대적인 구분일 뿐이다. In the above-described Fig. 1 was identified separately from the calling terminal 510 and the called terminal 530, which is just a relative sensitivity. 다시 말해서, 물리적인 구성 측면만을 본다면, 하나의 단말기는 상황에 따라 호출측이 될 수도 있고 피호출 측이 될 수도 있기 때문이다. In other words, because only the physical look side configuration, one terminal may be a calling party, depending on the situation can be a called party. 송수신부(tranceiver circuitry) 31은 사용자가 미리 입력하거나 단말기에 초기 입력되어 있는 메시지, 즉 긴급 상황을 알리기 위한 메시지를 미리 지정한 수신처들로 송신하거나 수신처들로부터의 호를 수신한다. Transmitting and receiving unit (tranceiver circuitry) 31 receives the call from the message, that is the transmission destination, or a message for informing the emergency situation to the pre-designated destination that a user is pre-filled, or the initial input to the device. 제어부(micro controller) 33은 사용자로부터 키패드에 할당된 긴급 호출 키의 입력이 감지되면 후술하는 메모리 39에 저장되어 있는 긴급 상황 알림 메시지와 수신처 리스트를 읽어 온다. Control (micro controller) 33 has reads the detection when the input of the emergency call key emergency situations stored in the memory 39 to be described later notification message and the destination list is assigned to the keypad by the user. 그리고 이들과 기지국 식별 정보 그리고 서버 등록 ID를 이용하여 제1 및 제2긴급 메시지를 만든다. And using these as base station identification and ID registration server makes the first and second emergency message. 여기서 상기 기지국 식별 정보는 단말기가 이동통신망의 기지국과 통신하여 획득해놓은 것이다. Wherein the base station identification information is haenoteun terminal obtains by communicating with the mobile communication network base station. 상기 제어부 33은, 상기 제1 및 제2긴급 메시지를 송수신부 31에 전달하여 수신처로 전송되게 한 후, 단말기의 모드를 긴급모드로 전환하도록 제어한다. The control unit 33 controls to switch the first and the second passes after an urgent message to the transceiver 31 to be transmitted to the destination, the terminal mode to the emergency mode. 이는 어느 한 수신처로부터 음성 호 연결 요청이 있을 경우 후술하는 스피커/마이크 43, 45 및 표시부 35의 기능을 긴급모드에 적절하게 제어하기 위함이다. This is to appropriately control the function of the speaker / microphone 43, 45 and the display 35 to be described later if there is a voice call connection request from any one of a destination in an emergency mode. 예를 들어, 제어부 33은 긴급모드일 때 수신처(긴급 상황을 전달받은 피호출 단말기)가 아닌 다른 단말기로부터의 호 연결 요청이 있을 경우 호 연결을 거절하는 기능을 수행할 수도 있다. For example, the controller 33 may perform a function to reject a call if there is a connection request from another terminal other than the destination (called terminal that received the emergency situation), when the emergency call connection mode. 메모리 39는 이동통신 단말기 고유의 동작을 제어하는 데 필요한 프로그램들을 저장함과 동시에 긴급 상황을 알리는 메시지를 저장하고 있다. Memory 39 has stored the message that the emergency programs necessary to control the specific operation of the mobile communication terminal at the same time stores. 상기 메시지는 사용자의 입력에 의해 변경 저장되어질 수 있다. The message may be stored by changing the input of the user. 또한 상기 메모리 39에는 수신처 전화번호를 적어도 한 개 이상 저장할 수 있는 영역이 구비되어 있다. In addition, the memory 39 is provided with an area for storing the destination telephone number for at least one. 또한 일반 수신처(피호출 단말기) 외에도 관리 서버 540의 전화번호를 저장하고 있어야 하며, 서버 등록 ID를 저장하고 있어야 한다. Also common destination (the called terminal), in addition to be stored and the number of the management server 540 and the server must store the registration ID and. 상기 서버 등록 ID는 제1긴급 메시지에 포함되어 관리 서버 540에 전송되며, 관리 서버 540은 이를 기초로 사용자(호출 가입자) 인증을 실시한 다음 신고센터 560에 통보하게 된다. The server ID is registered first is transmitted to the management server 540 it includes the emergency message, the management server 540 is notified to the call center 560, and then conducted by the user (calling party) authentication on the basis of this. 표시부 35는 제어부 33의 제어를 받아, 수신처를 설정하기 위한 동작이 진행되는 상태를 표시하거나 긴급 메시지의 전송 상황을 텍스트로 표시한다. Display unit 35 under the control of the control unit 33, and displays the state in which the operation for setting a destination or displays a transmission proceeding status of the emergency message to a text. 또한 상기 긴급 메시지 송신 후에는 이동통신 단말기가 긴급모드로 동작 중임을 나타내기 위하여 미리 설정된 아이콘을 표시한다. In addition, after transmitting the emergency message is displayed for a predetermined icon to indicate that the mobile terminal is operating in emergency mode. 예를 들면, "SOS 메시지 호출 중", "확인 전화//수신 대기 중" 등이다. For example, the "SOS message of call", "call confirm // of listening" and the like. 또한 긴급 메시지를 전송한 뒤부터 종료키가 입력될 때 까지, 즉 긴급모드로 동작 중일 경우에는, 제어부 33의 제어를 받아, 일반 모드에서와는 달리 호 요청 등을 포함한 모든 동작을 행할 때 백라이트를 동작시키지 않는다. In addition, since after sending an emergency message until the end key is input, that is, is operating in the emergency mode, under the control of the control section 33, the normal mode than it did not operate the backlight when performing all of the operations including different call request no. 이는 사용자가 가해자와 대면해 있을 경우 가해자가 사용자의 긴급 메시지 송출 사실을 모르게 하기 위함이다. This is for users to unknowingly transmit the fact that the perpetrators of the user emergency messages when you are confronted with the perpetrator. 스피커 43은 제어부 33의 제어를 받아 긴급모드에서는 외부에서의 호 연결 요청, 문자메시지 수신 혹은 기타 상태들의 알람을 위한 동작을 종료키가 입력될 때까지 중지한다. Speaker 43 is under the control of the control unit 33 in the emergency mode is disabled until the end key is input, a call connection request, the operation for the alarm of the text message received, or other state of the external. 긴급모드로 동작 중에는 긴급 문자메시지를 수신한 수신처로부터 호 연결 요청이 오더라도 벨소리 알림 없이 자동으로 연결된다. This from a recipient receives an urgent text messages while operating in emergency mode ohdeora call connection request is automatically connected to the ring without notification. 폴더형 단말기의 경우 폴더를 열지 않을 경우에는 스피커 기능을 중지시켜 뮤트 상태로 동작하게 하고 폴더를 열었을 경우에만 동작 가능하게 할 수도 있다. For a folder-type terminal, if not open the folder to stop the function of the speakers may be operably only operates in the mute state, and open the folder. 한편, 스피커 43이 동작하지 않을 때에도 후술하는 마이크 45는 동작을 하게 되는데, 이는 수신처와 호 연결이 되었을 경우 상대방이 현지 상황을 알아차릴 수 있도록 하기 위함이다. On the other hand, there is to the microphone 45 is operated, which will be described later, even when the speaker 43 is not in operation, which is to make the other party can notice the local conditions when the destination and the call connection. 마이크 45는 상기 설명한 것처럼 긴급모드일 때 수신처로부터의 호가 자동 연결되면 주변의 소리를 입력하여 전기적 신호로 변환해줌으로써 이 신호를 전달받은 상대방이 소리로써 현지의 상황을 짐작하거나 알 수 있도록 한다. Microphone 45 is to guess, or to know the local conditions as the other party received the signal by giving it converted to an electrical signal input to the sound around the sound when a call from the connection destination automatically when the emergency mode as described above. 키입력부 37은 다수의 키를 가지는 키패드 등으로 구성되어 있으며, 긴급 호출 기능의 수행에 필요한 가입자 설정을 위해 사용되는 키들 뿐만 아니라 이동통신 단말기의 각종 기능(카메라, 스피커 볼륨 등)을 제어하기 위한 별도의 버튼들도 구비한다. Separately for controlling the key input unit 37 is composed of a keypad, such as having a plurality of keys, and various function, as well as keys used for the subscriber settings necessary for performing the emergency call function mobile communication terminal (camera, speaker volume, etc.) the buttons are also provided. 또한 긴급 호출을 위한 별도의 버튼을 단말기의 일 측면에 더 구비 할 수 있으며, 이미 다른 기능을 위해 할당된 버튼을 새롭게 정의하여 긴급 호출 버튼으 로 사용 가능하다. Also may further include a separate button for the emergency call to an aspect of the device, and is already available to the newly defined with an emergency call button, the button coming allocated for other functions. 예를 들어, 스피커 볼륨 버튼을 수 초 이상 누른다거나 연속하여 수 회(예: 4회) 입력하면 자동으로 긴급 메시지가 만들어져 전송되게 정의할 수 있다. For example, the speaker volume button press over a few seconds or continuously several times: Entering (e.g. four times) can be defined to be automatically created and transmitted to the urgent message. 다음으로, 피호출 기능을 수행할 경우를 가정하여 단말기의 구성을 설명하면 다음과 같다. When assuming the following, a case to perform the called function explanation of the construction of the device as follows. 송수신부 31은 제2긴급 메시지, 관리 서버 540 혹은 이동통신 사업자 550으로부터 가입자 위치 정보를 수신한다. Transmitting and receiving unit 31 receives the subscriber's location information from the second emergency message, the management server 540 or the network operator 550. 제어부 23은 제2긴급 메시지가 수신된 경우 현재 단말기의 동작 여부(진동, 통화 등)에 관계없이 별도로 설정된 경고음이 울려 제2긴급 메시지가 수신되었음을 사용자에게 알리도록 오디오부 41을 제어한다. The controller 23 controls the second audio unit 41. When the urgent message is received, the alarm ring from a separate set regardless of the current operation status of the terminal (vibration, currency, etc.) to notify the user that the second emergency message has been received. 표시부 35는 수신된 제2긴급 메시지 혹은 관리 서버 540으로부터 수신된 가입자 위치 정보 등을 표시한다. Display unit 35 displays the subscriber location information and the like received from the received second messages or emergency management server 540. 도 3a ~ 도 3g는 호출 가입자가 본 발명의 바람직한 실시예에 따른 긴급 호출을 위해 단말기를 이용하여 긴급 호출 설정을 할 때의 화면 표시 예를 나타내는 도면들이다. Figure 3a ~ Figure 3g are views showing a screen display example at the time of the emergency call setup using the device for emergency calling in accordance with a preferred embodiment of the invention is the calling party. 도 3a는 메시지 관리 메뉴 화면이다. Figure 3a is a message management menu screen. 도시된 메뉴들 중 '애니콜 SOS'는 본 발명에 따른 긴급 호출 기능의 별칭으로서, 예를 들어 명명한 것이다. "Anycall SOS 'of the illustrated menu is one named for example as an alias for the emergency call function according to the present invention. 도 3b는 상기 도 3a와 같은 상태의 화면을 보고 호출 가입자가 '애니콜 SOS'를 선택했을 때 열리는 서브-메뉴 화면이다. Figure 3b is held when the sub-select the state of the called party to see the screen, Anycall SOS 'as shown in FIG. 3a - is a menu screen. 참조부호 400과 같이, 호출 가입자는 긴급 구조 모드 혹은 상기 지정 호출 모드를 설정할 수 있다. As reference numeral 400, the calling party may set up the emergency call mode or the specified mode. 긴급 구조 모드는 제1긴급 메시지와 제2긴급 메시지를 생성하여 각각 관리 서버 540과 피호출 단말기 530으로 송신하는 모드이다. Emergency mode is a mode to be transmitted to each of the management server 540 and the called terminal 530 to generate a first Emergency messages and the second emergency message. 반면에 지정 호출 모드는 제2긴급 메시지만 생성하여 피호출 단말기 530에만 송신하는 모드이다. On the other hand, specify call mode is a mode for transmitting the second to generate only urgent messages called terminal 530 only. 도시된 바와 같이 두 개의 창 410, 420이 열리게 되는데, 하나(410)는 수신처 전화번호를 입력하기 위한 것이고 다른 하나(420)는 긴급 상황을 알리는 메시지를 미리 보여주기 위한 것이다. There is the two windows 410, 420 open, as shown, one (410) is for inputting a destination telephone number and one (420) is to show a message to inform the emergency situation previously. 호출 가입자는 자신이 정한 우선순위에 입각하여 수신처 전화번호를 적어도 하나 이상 직접 입력해야 한다. Calling subscriber must manually enter at least one phone number to a destination based on the priorities they set. 다수의 수신처 전화번호가 포함되는 이유는 긴급 상황이 발생한 시점에 피호출 가입자가 어떤 상태일지 예측할 수 없기 때문이다. Reasons included a number of destination telephone numbers is because the called subscriber at the time of occurrence of an emergency situation to predict what state journal. 다시 말해서, 단일 수신처를 지정한 경우 해당 피호출 가입자가 전화를 받을 수 없는 상황(예: 전원 오프, 부재 중, 통화 중 등)일 때를 대비해야 하기 때문에 이처럼 다수의 수신처를 저장해놓고 동일한 메시지를 동보 전송하는 것이다. In other words, if you specify a single recipient that the called subscriber is the situation that can not receive calls: because you have to prepare for when (for example, power-off, missed, such as during a call), thus a large number of identical messages stored in the destination haenotgo broadcast transmitting to. 긴급 상황을 알리는 메시지는 자동으로 표시되는데, 이는 구현 예에 지나지 않으며, 호출 가입자가 직접 입력하거나 수정할 수 있음은 물론이다. Message indicating an emergency situation, there is automatically displayed, which are only available on the embodiment, the calling party can be entered or modified directly, of course. 도 3c는 도 3b와 같은 상태의 화면에서 호출 가입자가 입력한 수신처 리스트를 보여주는 화면이다. Figure 3c is a screen showing a destination list of calling subscriber is input on the state of the screen as shown in Fig. 3b. 입력이 정확히 되었는지, 우선순위를 바꿀 필요는 없는지 등을 다시 한번 확인할 수 있도록 하기 위한 것이다. If the input is correct, to change the priority is to make sure once again see the like. 실제로 단문메시지 작성 시 포함되는 수신처 리스트는 관리 서버 540의 전화번호를 가지고 있지만, 도 3c의 화면에는 표시되지 않는다. But actually have the phone number of the destination list management server 540 includes a short message during writing, it does not appear in the screen of Fig. 3c. 상기 각 수신처 전화번호는 우선순위를 정하여 저장할 수도 있다. Each of the destination phone numbers may be appointed to store the priority. 단, 사용자가 지정한 일반 수신처는 관리 서버 540보다 우선할 수는 없다. However, the general destination specified by the user will not be able to take precedence over the management server 540. 수신처 전화번호 입력을 마친 호출 가입자가 확인키를 입력하면 그 입력에 응답하여 도 3b의 화면이 도 3c의 화면으로 전환되게 구현할 수 있다. If the call completing the destination telephone number entered subscriber to enter a verification key may be implemented to switch to the display screen of FIG. 3c of Figure 3b in response to the input. 도 3d는 긴급 상황을 반복해서 알리는 횟수를 설정하기 위한 화면이다. Figure 3d shows a screen for setting the number of repeatedly informing the emergency. 도 3c와 같은 상태의 화면을 보고 자신의 입력 사항에 대한 확인을 마친 호출 가입자가 확인키를 입력하면 그 입력에 응답하여 도 3d와 같이 화면이 전환되도록 구현할 수 있다. If you also see the status screen and 3c is called completing the confirmation of their entry subscribers enter the confirmation key can be implemented so that the screen changes as shown in Fig. 3d in response to the input. 도 3e는 호출 가입자의 관리 서버 등록 ID를 입력하기 위한 화면이다. Figure 3e is a screen for inputting a registered ID management server of the called party. 도 3d와 같은 상태의 화면에서 반복 횟수(예: 2회)를 설정한 후, 상방향 스크롤키를 입력하면 그 입력에 응답하여 도 3e와 같이 화면이 전환되도록 구현할 수 있다. Repeat in the status screen, such as 3d number of times (e.g., twice), after setting the input to the upward scroll key can be implemented so that the screen changes as shown in Figure 3e in response to its inputs. 도시된 '애니콜랜드'는 본 발명에 따른 긴급 호출 시스템의 관리 서버 540(예: 무선 인터넷 홈페이지)의 별칭으로서, 예를 들어 명명한 것이다. Illustrated, Anycall Land "is the management server 540 of the emergency call system according to the present invention: one is an alias (for example, wireless Internet website), for example, named. 도 3f는 관리 서버에 접속하기 위한 인증 ID를 입력하기 위한 화면이다. Figure 3f is a screen for inputting the authentication ID for connecting to the management server. 도 3g는 도 3b 혹은 도 3d와 같은 상태의 화면에서 도움말을 보기 위해 메뉴키를 눌렀을 때 표시되는 화면이다. Fig. 3g is a screen that is displayed when you press the menu key to view the article in Fig. 3b or the state of the screen, such as the 3d. 상기 도움말은 긴급 호출 기능을 사용하는 방법을 알려주기 위한 메시지들로 이루어진다. The article consists of a message to inform you how to use the emergency call function. 도 4a 및 도 4b는 본 발명의 바람직한 실시예에 따른 긴급 호출시 피호출 가입자 단말기의 화면에 표시되는 긴급 메시지의 예를 나타내는 도면들이다. Figures 4a and 4b are diagrams showing an example of the emergency message displayed on the screen of the called party terminal when an emergency call according to an embodiment of the present invention. 도 4a는 긴급 상황이 발생했을 때 호출 수신기 510에서 만들어져 피호출 단말기 530의 화면에 표시되는 제2긴급 메시지의 예이다. Figure 4a is an example of a second emergency message displayed on the receiver of the call is made from the called terminal 510, 530 when an emergency occurs screen. 피호출 가입자가 이 제2긴급 메시지를 확인하고 통화버튼을 누르면 호출 단말기 510으로 음성 호가 송출된다. Voice call is sent to the calling terminal 510, the called party presses the check for the second message and emergency call button. 제2긴급 메시지에 포함된 긴급상황 알림 메시지(예: 긴급 상황입니다. 도와 주세요. )은 사용자에 의해 입력될 수도 있고 단말기 내에 초기 저장되어 있을 수 있 다. The second emergency alert message that contains an urgent message (eg. An emergency help) is can be also be entered by the user and is initially stored in the terminal. 제2긴급 메시지의 내용은 예를 들면, "[애니콜 SOS]//긴급 상황입니다.//도와 주세요.//기지국ID-OOO00" 등이 될 수 있다. The contents of the second emergency message, for example, may be a "[Anycall SOS] // Help with emergency situations .// .// station ID-OOO00". 여기에서 기지국 식별 정보는 이동통신 단말기가 기지국과 통신을 위해 이미 저장하고 있는 값이며, 통신하고 있는 기지국이 변경되면 그에 따라 단말기에 저장된 기지국 식별 정보도 변경된다. Here, base station identification information is a value that is already stored for the mobile communication terminal and the base station communication, when the communication and the base station changes thereby also changing the base station identification information stored in the terminal. 제2긴급 메시지를 수신한 피호출 단말기 530은 상기 기지국 식별 정보를 이용하여 호출 가입자의 대략적인 위치 정보를 알 수 있게 된다. Second receiving the emergency message the called terminal 530 is able to know the approximate location of the calling subscriber using the base station identification information. 도 4b는 호출 가입자의 긴급 상황이 접수된 관리 서버 540에서 만들어져 피호출 단말기 530의 화면에 표시되는 단문메시지의 예이다. Figure 4b is made in an emergency situation of the called party is received the management server 540. An example of a short message displayed on the screen of the called terminal 530. 피호출 가입자가 이 단문메시지를 확인하고 통화버튼을 누르면 관리 서버 540이 단문 메시지를 통해 전달한 유알엘로 자동 접속하게 된다. The called party confirmed that this is a short message, and press the call button to automatically connect to the management server 540 delivered via SMS yualel. 이로써 피호출 단말기 530이 관리 서버 540에 연결되면 피호출 가입자는 관리 서버 540으로부터 자신의 피호출 단말기 530에 가입자 위치정보를 다운로드 받아 확인할 수 있다. This blood when called terminal 530 is connected to the management server 540 the called party is available by downloading the subscriber location information to their called terminal 530 from the management server 540. 도 5는 본 발명의 바람직한 실시예에 따른 긴급 호출 제어 방법을 나타낸 레더(lader) 다이어그램이다. 5 is a ladder (lader) diagram showing an emergency call control method according to an embodiment of the present invention. 각 단계의 번호(Sxxx)는 이해를 돕기 위해 도 1의 해당 동작에 대한 참조번호와 일치하도록 부여했음을 밝혀둔다. Number of steps (Sxxx) is put out so as to give that is consistent with the reference number for the operation of the first to assist understanding. 첫째, 긴급 메시지가 발생되어 수신처(피호출 단말기 및 관리 서버)에 전달되는 과정을 자세히 설명하면 다음과 같다. First, A detailed description of the process is that the emergency message when transmitted to the destination (called terminal and management server) as follows. S112_1단계에서 호출 단말기 510이 제1긴급 메시지를 기지국 520에 전송하면 S120단계에서 기지국 520이 상기 제1긴급 메시지를 관리 서버 540에 전달한다. When the calling terminal 510 in step S112_1 sending a first urgent message to the base station 520 transmits the base station 520 of the first emergency message in step S120 to the management server 540. 다음으로, S112_2단계에서 호출 단말기 510이 제2긴급 메시지를 기지국 520에 전송하 면 S114단계에서 기지국 520이 상기 제2긴급 메시지를 피호출 단말기 530에 전달한다. Next, the calling terminal 510 in step S112_2 to deliver the first base station 520 at step S114 and transmitting surface 2 urgent message to the base station 520 and the second emergency message to the called terminal 530. 긴급 메시지는 관리 서버 540으로 전송하는 제1긴급 메시지와 기타 사용자가 지정한 수신처로 보내는 제2긴급 메시지로 구분된다. Emergency messages are separated by a second emergency message is sent to the first emergency messages and other destination specified by the user to send to the management server 540. 제1긴급 메시지는 긴급 상황을 알리기 위한 메시지, 적어도 하나 이상의 피호출 단말기(수신처) 전화번호, 상기 가입자의 전화번호, 관리 서버 등록 아이디, 및 기지국 식별 정보를 포함한다. The first emergency message comprises a message to inform the emergency situations, at least one called terminal (destination) number, the subscriber telephone number, registration ID management server, and base station identification. 제2긴급 메시지는 긴급 상황을 알리기 위한 메시지, 상기 가입자의 전화번호, 및 기지국 식별 정보를 포함한다. The second emergency message includes a message for announcing an emergency, of the subscriber telephone number, and base station identification. 긴급 메시지의 전송은 이동통신 단말기의 대기 모드에서 이루어진다. Transmission of an emergency message is performed in the standby mode of the mobile communication terminal. 또한 긴급 메시지의 전송은 메모리 39에 저장되어 있는 수신처 리스트를 참조하여 전화번호 저장 순서대로 이루어진다. In addition, transmission of the emergency message, by referring to the destination list stored in the memory 39 takes place in the phone number storage order. 즉, 먼저 관리 서버 540에 전송하고, 그 다음에 사용자 지정 수신처에 순서대로 전송한다. That is, first, transmitted to the management server 540, then the user will be transmitted in order to specify the destination on. 만약 하나의 수신처로 전송 중 전송 오류가 발생 할 경우에는 재발송하지 않고 다음 수신처로 발송을 하고 기저장한 수신처를 모두 발송한 이후에 전송 실패한 수신처에 대해 재발송을 수행한다. If one when a transmission error has occurred during transmission to the destination without retransmission perform retransmission for the failed transmission destination after sending all the destinations and a pre-stored and then sent to the recipient. 예를 들어, 도 3c와 같이 10명의 수신처(관리 서버 전화번호 + 9개의 피호출 단말기 전화번호)가 저장되어 있고, 도 3e와 같이 2회 반복으로 설정했다면, 해당 수신처에 해당 긴급 메시지를 발송한 이후에 다시 한번 더 전송하게 된다. For example, the sending the 10 destination (management server telephone number + 9 called terminal number) and is stored, if set to two times as shown in Figure 3e, corresponding to the destination emergency message as shown in Figure 3c since it is once again sent to. 호출 단말기 510은 긴급 메시지의 발송 시작과 함께 약한 진동을 일으키게 되는데, 이는 사용자가 제대로 동작하고 있음을 인지하도록 하기 위한 것으로, 선택사항이다. Call terminal 510 cause there is a weak vibration with the start of sending an emergency message, which is to be optional, to be sure that you are operating properly. 긴급 메시지는 일반 단문메시지와 다르게 처리되어야 하므로 호출 단말기 510이 긴급 메시지를 만들 때 특수 문자코드를 첨부하여 구분이 용이하게 할 수 있다. Emergency messages must be handled differently than regular SMS messages, so you can easily attach a distinction is the special character code when calling terminal 510 to make an emergency message. 피호출 단말기 530은 단문메시지를 수신한 경우 특수 문자코드가 검출되면 긴급 메시지임을 인식하고 기존에 설정되어 있는 문자메시지 수신 알림 방법과 관계없이 긴급 메시지 수신 알림음을 벨소리 최대 음량으로 출력한다. If the called terminal 530 has received a short message when the special character code is detected, it recognizes the emergency messages and outputs the received emergency message alert tone, regardless of the received text is set to an existing message notification method Ringtone maximum volume. 긴급 메시지 수신 알림음 역시 기존 문자 메시지 수신 알림음과는 다른 사이렌 등과 같이 새롭게 구성함이 바람직하다(이하 긴급 벨소리). Received an urgent message alert tone is also preferred that the new configuration, such as traditional text messages received notification sound that is different from the siren (the emergency ring). 긴급 메시지 수신 시 알림 간격은 알림 주기(한번만/2분마다/알림 없음) 설정에 따라 다음과 같이 동작한다. Upon receiving an emergency message notification interval operates as follows according to the notification period (once / every two minutes / No alerts) setting. - 알림 없음/한번만: 긴급 메시지가 도착하면 한번만 긴급 벨소리를 최대 음량으로 출력함. - No alerts / once: when you get an urgent message to output an emergency ring at full volume once. - 2분마다 알림: 긴급 메시지가 도착하면 2분마다 긴급 벨소리를 최대 음량으로 출력함. - notification every 2 minutes: If you have an urgent message arrives outputs an emergency ring at full volume every two minutes. 또한 통화 중 긴급 메시지가 수신되는 경우에는 설정된 문자 메시지 수신 알림 모드와 무관하게 긴급 메시지 수신을 알리기 위한 긴급 벨소리는 낮은 음량으로 출력한다. In addition, it has nothing to do with predetermined text messages notifications mode when an urgent message during a call received emergency alert ringtone for the incoming emergency message is output at a low volume. 그리고 브라우저 동작 중, 모뎀 통신 중, 부가서비스 동작 중 긴급 메시지 착신 시에는 아이콘을 표시부 35에 표시함과 동시에 긴급 벨소리를 출력한다. And the operation of the browser, and outputs a ring tone to the emergency communication modem of, the icon for emergency message destination of the supplementary service operations and at the same time displayed on the display 35. 호출 단말기 510은 긴급 메시지 전송 후 긴급모드로 전환된 상태에서 외부로부터의 호 연결 요청이 감지되면 발신측의 전화번호를 확인하게 된다. Call terminal 510 when the call connection request from the outside is detected by the switch to the emergency mode, after the emergency message transmission condition is to get the phone number of the calling party. 만약 긴급 메시지 수신처로 지정되어 있는 전화번호로부터의 호 연결 요청이라면 곧바로 통화를 연결시키지만, 긴급 메시지 수신처로 지정된 전화번호가 아닐 경우에는 호 연결 을 거절한다. If the call connection request from the telephone number that is assigned to the urgent message destination, but immediately connect to the call, if the phone number is not specified as an emergency message, the recipient refuses the call connection. 이때 자동 응답 기능을 이용하여 사용자가 긴급 상황에 처해 있으니 경찰서/소방서 등에 신고해 달라는 메시지를 전송할 수가 있다. In this case, using an autoresponder, so users in emergencies can send a message asking us to report such police / fire station. 둘째, 긴급 상황이 관리 서버 540에 접수된 후의 동작 과정을 설명한다. Second, the operation process after the emergency has been received by the management server 540. S130단계에서 관리 서버 540은 신고센터 560, 즉 상황실이나 경찰서 소방서 등과 같은 관공서에 긴급상황 알림 메시지와 가입자 위치정보를 전송한다. In step S130 the management server 540 sends an emergency alert message and subscriber location information in a public office such as call center 560, or the police control room or fire station. 상기 위치 정보는 지도 데이터 또는 자동응답 메시지와 같은 방법이 이용될 수 있다. The location information is the same method as the map data or automatic response message may be used. 그리고 S124-1단계에서 관리 서버 540은 제1긴급 메시지에 포함된 피호출자 단말기 전화번호를 추출하여 가입자 위치정보 제공 의사를 묻는 단문메시지를 전송한다. In step S124-1, and the management server 540 transmits a short message asking the subscriber location information provided to physician extracts the callee terminal number included in the first emergency message. 상기 수신처들은 이미 가입자로부터 제2긴급 단문 메시지를 수신한 상태이지만 가입자의 정확한 위치를 알고 있지 못한 상황이다. Although the destination are already receiving a second emergency SMS message from a subscriber is a situation not know the exact location of the subscriber. 그러므로 관리 서버 540에서 전송한 메시지에는 관리 서버 540에서 생성한 가입자 위치 정보를 확인할 수 있는 서버의 유알엘 정보를 제공하고 바로 연결하여 수신측 단말기가 이를 확인할 수 있도록 한다. Thus, the message sent by the management server 540 is to provide yualel information of the server to verify the subscriber's location information generated by the management server 540 and directly connected so that the receiving terminal can verify this. 이후 S122단계에서 수신처로부터 상기 의사를 수용한다는 응답(예: 통화버튼 누름)이 오면, 124_2단계에서 관리 서버 540은 수신처에 가입자 위치 정보를 제공한다. After receiving the response that the doctor from a destination in step S122 (for example, the call button is pressed down) comes, in step 124_2 management server 540 provides a subscriber location information to the recipient. 이때 가입자의 위치 정보를 제공하는 방법은 상기와 같은 지도 파일 등을 생성하여 제공하는 방법외에도 자동응답 메시지와 같은 방법을 활용할 수도 있다. The method of providing location information of the subscriber in addition to methods for providing such by creating a map file as described above may utilize the same way as the automatic response message. 또한 제1긴급 메시지에는 서버 등록 ID가 포함되어 있으므로, 관리 서버 540은 상기 제1긴급 메시지를 수신하게 되면 상기 서버 등록 ID를 찾고 이를 근거로 데이터베이스를 검색하여 호출 가입자의 신상을 파악할 수 있다. Also, because it contains the first emergency message, the server registration ID, the management server 540 can determine when the statue of the first to receive urgent messages from the database server as basis, looking at the registration ID to the calling party. 관리 서버 540이 신고센터 560에 전송하는 이메일에는 가입자 위치 정보가 포함될 수 있다. Email to a management server 540 transmits the call center 560 may include a subscriber's location information. 제1긴급 메시지에는 기지국 식별 정보가 포함되어 있으므로, 관리 서버 540은 제1긴급 메시지를 수신하면 기지국 식별 정보를 찾고 이를 이용하여 보다 정확한 위치를 추적하게 된다. The way, the management server 540 receives a first urgent message because the message includes the first emergency base station identification information is more accurate track position by using this, and looking at the base station identification. 기지국 식별 정보는 단순히 이동통신 단말기가 통신을 하고 있는 기지국을 식별하는 번호이기 때문에 실제 어느 곳에 있는지 일반 사람들은 알 수가 없다. Since the base station identification information is simply a number that identifies the base station, which is a mobile communication terminal that the actual anywhere Common people do not know. 그러므로 기지국 식별 정보를 이용하여 실제 지리적인 위치를 알기 위해서는 각 기지국이 설치된 지리 정보, 각 기지국을 커버(cover)하는 통신영역 정보, 그리고 각 기지국의 식별 정보를 포함하는 데이터베이스(도시하지 않음. )가 있어야만 한다. Therefore, in order to know the actual geographical location using the base station identification information (not shown) database that contains the identification information of the communication area information, and each base station that covers (cover) the geographic information, the base stations, each base station is installed is there must. 상기 데이터베이스는 관리 서버 540이 가지고 있을 수 있다. The database can be a management server 540 has. 그렇지 않으면, 관리 서버 540이 이동통신 사업자 560의 데이터베이스를 이용하여 기지국 식별 정보만을 가지고 호출 가입자(긴급 메시지 발신자)의 정확한 위치를 추적할 수도 있다. Otherwise, the management server 540 has only the base station identification information using a database of 560 mobile operators can track the exact location of the calling subscriber (urgent message sender). 도시하지 않았으나, 124_1, S122, 124_2단계들과 같은 방식이 아니라, 수신처에서 직접 관리 서버 540으로 발신자의 위치를 문의하여 응답을 받을 수도 있다. Although not shown, 124_1, S122, not the same way as step 124_2, and contact the sender directly to the location management server 540 may receive a response from the recipient. 셋째, 긴급 상황을 감지한 피호출 단말기 530과 이동통신 사업자 560 사이의 동작 과정을 설명하면 다음과 같다. Third, when explaining the operation procedure between the called terminal 530 and the network operator 560 detects an emergency, as follows. 긴급 메시지를 받은 사람은 자신의 단말기를 이용하여 이동통신 사업자에게 발신자의 위치 정보를 요구할 수 있다. Who received an urgent message may ask the caller location information to mobile operators, using their own terminal. 즉, S126단계에서 피호출 가입자가 자신의 단말기 530을 이용하여 음성 혹은 단문메시지 형태로 이동통신 사업자 550에게 호출 가입자의 위치 정보를 요구한다. That is, by using the called party is his terminal 530 in step S126 requests the location information of the call to the mobile operator 550 to a voice or short message form the subscriber. 상기 요구를 받은 이동통신 사업자 550은 S250 단계에서 상기 호출 가입자가 이동통신 사업자 550이 제공하는 친구 찾기 또는 위치 찾기 서비스 등에 가입이 되어 있는지 여부를 확인한다. 550 mobile operators receiving the request shall determine whether the calling subscriber is enrolled in the mobile operator to provide 550 Find a friend or Latitude in step S250. 상기 확인 결과 가입되어 있다고 판단되면 S255단계에서 상기 호출 가입자의 현재 위치를 추적한다. If it is determined that the check result is joined to track the current location of the called subscriber in step S255. 그리고 그 결과를 피호출 단말기 530에 전송한다. And it transmits the result to the called terminal 530. 만약 호출 가입자가 친구 찾기 또는 위치 찾기 서비스 등에 가입되어 있지 않은 가입자라면 S128_2단계에서 서비스 불가 응답을 전송한다. If the called party subscriber is not enrolled in the Find or Find a service where friends and transmits the service is not responding in S128_2 step. 네째, 긴급 상황을 감지한 피호출 단말기 530과 호출 단말기 510 사이의 동작 과정을 설명하면 다음과 같다. Fourth, when explaining the operation procedure between the called terminal detects an emergency 530 call to the terminal 510 as follows. 긴급 메시지를 확인한 사람은 대개 먼저 발신자와 통화를 해보고자 할 것이다. Who confirmed the urgent message usually will want to first try the caller and the call. 이 경우 S118단계에서와 같이 피호출 단말기 530이 음성 호를 요청하게 된다. In this case, the called terminal 530, as in step S118 is a voice call request. 상기 음성 호 요청을 수신한 기지국 50은 이를 S116단계에서와 같이 호출 단말기 510에 음성 호를 요청한다. The voice call the base station 50 receives the request requests the voice call to the called terminal 510, such as this, as in step S116. 긴급 메시지를 전송한 호출 단말기 510은 긴급 메시지를 수신한 다수의 상대방으로부터 호 연결(이하 긴급 통화라 함.) 요청이 있어 연결이 이루어지는지 여부에 관계없이 종료키를 누르기 전에는 계속해서 긴급모드(긴급 통화 대기 상태)를 유지한다. Calling transmitting the emergency message the terminal 510, a call connection from a number of the other party receiving the emergency message (hereinafter referred to as an emergency call.) Until the request is got pressing the end key, regardless of whether a connection is made to continue the emergency mode (emergency It maintains the call waiting state). 긴급 메시지를 반복해서 전송하는 도중에 수신처로부터의 긴급 통화가 자동 착신되더라도 남아 있는 수신처로의 긴급 메시지가 있으면 마저 송출한다. If the urgency of the message to the destination even if the remaining emergency call is automatically transmitted to the destination from the destination during the emergency message is repeatedly transmitted even. 수신처로부터 음성 호가 착신되었을 경우에는 일체의 벨소리와 같은 알람 없이 자동으로 통화를 연결한다. When a voice call from the called destination is automatically connected to the call without the alarm, such as a ring tone of one body. 자동 착신 시에는 긴급 메시지 전송을 시작할 때 발생시켰던 약한 진동을 동일한 방식으로 출력할 수 있다. Automatic forwarding may output a weak vibration that had occurred at the start of the emergency message transmitted in the same way. 긴급 메시지 전송의 시작부터 종 료키로 상황을 종료시킬 때까지 단말기 내/외부 표시부 35의 백라이트는 동작시키지 않는다. Until the end of the back light of the situation key exit from the beginning of the emergency message transmission device internal / external display unit 35 does not operate. 지정된 수신처로 긴급 메시지 발신 도중 발신 실패 메시지가 발생하면, 재발신하지 않고 다음 수신처로 발신 시도를 하며, 긴급통화 대기 중에 지정 수신처 이외에서 문자 메시지가 착신된다면 별도 알림 없이 자동 저장한다. If the caller fails, the message during an emergency message transmission to the designated destination occurs without the caller and redial attempts to the next destination, if the incoming text messages in a non-designated destination during an emergency call waiting is automatically stored without notification. 또한 긴급모드 동작 중 알람/스케쥴/D-Day 등 각종 알림이 필요한 상황에 대해서는 보류한 후, 긴급모드가 종료되면 처리한다. Further, the materials were held for the necessary various alert conditions such as alarm / schedule / D-Day operation of the emergency mode, the processing when the emergency mode is terminated. 만약 이동통신 단말기가 통화권을 이탈한 지역에서 사용자가 긴급 호출 버튼을 동작 시킬 경우에는 긴급 호출 버튼의 인식을 알리는 진동 후 통화권 이탈 메시지를 외부 창에 표시하고 서비스 가능 지역으로 이동하면 다시 진동 후에 긴급 메시지 발신 등의 기능을 동작시킨다. If the mobile communication terminal if the case to operate the called user and an emergency button in the area where you left the coverage, after vibration informing the recognition of an emergency call button to display the out-of-coverage message to the external box and moved to the service coverage area again emergency after vibration message to activate the feature, such as calling party. 한편 본 발명의 상세한 설명에서는 구체적인 실시 예에 관해 설명하였으나, 본 발명의 범위에서 벗어나지 않는 한도 내에서 여러 가지 변형이 가능함은 물론이다. While the invention has been shown and described with reference to certain preferred embodiments thereof, various modifications are possible within the limits that do not depart from the scope of the invention. 그러므로 본 발명의 범위는 설명된 실시 예에 국한되어 정해져서는 안되며 후술하는 특허청구의 범위뿐 만 아니라 이 특허청구의 범위와 균등한 것들에 의해 정해져야 한다. While the invention has been limited to the described embodiments jeonghaejyeoseo shall be defined by the scope and equivalents of the things that the appended claims as well as the claims, which must not be described later. 상술한 바와 같이 본 발명은 이동통신 단말기 사용자가 긴급한 상황에 처해 있을 경우 자신의 상황을 알리고 구조를 요청하기 위해 원터치로 단문메시지를 전 송할 수 있어 편리하다. The present invention is useful to a single touch can transfer a short message to request before the structure to inform their situation if there is a mobile terminal user are at an emergency, as described above. 또한 다수의 수신처로 긴급 메시지를 한번에 전송할 수 있는 장점이 있다. There is also the advantage of being able to send an urgent message to multiple recipients at once. 또한 이동통신 사업자의 서비스 가입이나 종류에 상관없이 이동통신 단말기만으로 긴급 호출을 할 수 있는 장점도 있다. There are also advantages to an emergency call only mobile communication terminals regardless of the subscription or service type of mobile operators. 또한 긴급 호출을 한 이동통신 단말기 사용자가 음성 통화가 불가능한 상황에서도 긴급 상황을 감지한 수신처에서 호 연결을 시도하면 통화로가 연결되어 주변 소리의 감지로 현지 상황을 보다 정확하고 안전하게 파악할 수 있는 장점도 있다. Further advantages that can identify a mobile device when a user attempts a call connection from destination to recognize the emergency situation in situations that can not be a voice call is a call to be connected to the sensing of ambient sound safe and more precise local situations emergency calls even have. 또한 긴급상황을 관리하는 관리 서버를 통해 경찰서 및 소방서와 같은 관공서와 연계하여 사용자에게 보다 실질적인 구호를 할 수 있게 하는 장점도 있다. There are also advantages to allow through the management server to manage the emergency situation in conjunction with the Government, such as police and fire departments to a more substantial relief to users. 상기 호출 단말기는 긴급구조 혹은 지정호출 모드를 구별하여 동작하며, 상기 긴급구조 모드일 때만 상기 관리 서버에 상기 제1긴급 메시지를 송신함을 특징으로 하는 긴급 호출 시스템. The called terminal is an emergency call system which is characterized by transmitting the first emergency message to the management server only when the operative to identify the emergency call or designated mode, the emergency mode. 상기 메모리는 상기 긴급상황을 알리기 위한 메시지, 관리 서버 등록 아이디, 상기 적어도 하나의 피호출 단말기 전화번호 및 상기 기지국 식별 정보를 저장하는 것임을 특징으로 하는 긴급 호출 시스템. The memory is an emergency call system, characterized in that to store the message for announcing the emergency situation, the management server registration ID, the at least one called terminal number and the base station identification information. 상기 관리 서버가 상기 피호출 단말기로부터 상기 호출 단말기의 위치 정보 요구를 감지하면, 상기 기지국 식별 정보에 의거 상기 호출 단말기의 위치를 계산하여 음성으로 안내함을 특징으로 하는 긴급 호출 시스템. The administration server is an emergency call system, characterized in that the called upon detecting the location information request of the calling terminal from the terminal, to calculate the location of the called terminal based on the base station identification information with voice guidance. 상기 관리 서버가 상기 적어도 하나의 피호출 단말기로부터 상기 호출 단말기의 위치 정보 요구를 감지하면 상기 기지국 식별정보에 의거 상기 호출 단말기의 위치를 계산하여 지도에 표시하고, 상기 피호출 단말기에 상기 지도를 다운로드 가능한 유알엘을 송신함을 특징으로 하는 긴급 호출 시스템. If the management server detects a position information request of the calling terminal from the at least one called terminal, and to calculate the location of the called terminal based on the base station identification information on the map, to download the map for the called terminal emergency call system, characterized in that the transmission can yualel. 상기 관리 서버는 긴급상황을 알리기 위한 정보를 긴급상황 신고센터에 송신함을 특징으로 하는 긴급 호출 시스템. The Management Server is an emergency call system which is characterized by transmitting the information to notify the emergency to an emergency call center. 상기 긴급상황을 알리기 위한 정보에는 상기 호출 단말기의 위치 정보가 포함됨을 특징으로 하는 긴급 호출 시스템. Is information for notifying the emergency call to an emergency system which is characterized by the location information of the calling terminal included. 상기 긴급모드에서 상기 피호출 단말기로부터 음성 호가 송출되면 마이크가 구동되어 상기 피호출 단말기로 주변 소리를 이용한 상황 전달이 되도록 구성함을 특징으로 하는 긴급 호출 시스템. Emergency call system when the voice call is transmitted from the called terminal in the emergency mode, characterized in that it is configured to transfer the driving situation, a microphone using the ambient sound to the called terminal. 상기 제1 혹은 제2긴급 메시지가 상기 관리 서버에 등록된 상기 호출 단말기의 아이디를 더 포함함을 특징으로 하는 긴급 호출 시스템. Emergency call system, characterized in that the first or second emergency message further comprises the identity of the calling terminal registered in the management server. 여기서 상기 긴급 호출 기능 설정 정보는 상기 제1 및 제2긴급 메시지를 전송할 하나 이상의 긴급 메시지 수신처, 긴급 상황을 알리기 위한 상기 제1 및 제2긴급 메시지의 내용, 상기 제1 및 제2긴급 메시지의 반복 전송 횟수를 포함함을 특징으로 하는 긴급 호출 제어 방법. Wherein said emergency call function setting information, said first and second one to transfer the urgent message more urgent message recipient, the first and second information, the emergency message, the first and second iterations of the emergency message to inform the emergency situation emergency call control method characterized in that it comprises a number of transmissions. 상기 긴급구조 모드 혹은 상기 지정호출 모드는 상기 긴급 호출 기능 설정 정보 등록시 상기 가입자에 의해 결정된 것임을 특징으로 하는 긴급 호출 제어 방법. The emergency call mode or the designated mode is the emergency call control method characterized in that determined by the subscriber wherein the emergency call function setting information during registration. 상기 제2긴급 메시지가 상기 제2긴급 메시지의 내용과 상기 호출 단말기의 전화번호를 포함함을 특징으로 하는 긴급 호출 제어 방법. Emergency call control method is characterized in that the second emergency message contains a telephone number of the second information, the emergency message and the called terminal. 상기 제1 혹은 제2긴급 메시지가 상기 관리 서버에 등록된 상기 호출 단말기의 아이디를 더 포함함을 특징으로 하는 긴급 호출 제어 방법. Emergency call control method, characterized in that the first or second emergency message further comprises the identity of the calling terminal registered in the management server. 상기 관리 서버가 상기 제1긴급 메시지를 수신하면 긴급상황 신고센터에 긴급상황을 알리기 위한 정보를 송신하는 과정을 더 포함함을 특징으로 하는 긴급 호출 제어 방법. Emergency call control method characterized by further comprising a step in which the management server, upon receiving the first message transmits the emergency information for notifying the emergency report to the emergency center. 상기 관리 서버는 상기 제1긴급 메시지를 수신하면 상기 적어도 하나의 피호출 단말기로 상기 호출 단말기의 위치 정보를 수신할 것인지 여부를 묻는 메시지를 송신하고, 상기 적어도 하나의 피호출 단말기로부터 응답이 수신되면 상기 적어도 하나의 피호출 단말기에 상기 호출 단말기의 위치 정보를 제공하는 과정을 더 포함함을 특징으로 하는 긴급 호출 제어 방법. Wherein the management server when the first when receiving the emergency message, the at least one of a called terminal transmits the asking if you want to receive the location information of the called terminal message, a response is received from the at least one called terminal emergency call control method characterized by further comprising the step of providing location information of the called terminal to the at least one called terminal. 상기 적어도 하나의 피호출 단말기는 상기 제2긴급 메시지를 수신하면, 상기 관리 서버로 상기 호출 단말기의 위치 정보를 요구하여 상기 관리 서버로부터 상기 호출 단말기의 위치 정보를 제공받는 과정을 더 포함함을 특징으로 하는 긴급 호출 제어 방법. The at least one called terminal is characterized in that the second upon receipt of the emergency message, further comprising the step of receiving the location information of the called terminal from the management server to request the location information of the called terminal to the management server, emergency call control method. 상기 제1긴급 메시지의 송신은 상기 제2긴급 메시지의 송신보다 앞섬을 특징으로 하는 긴급 호출 제어 방법. Emergency call control method characterized by the transmission of the first message is an emergency antecedence than the transmission of the second emergency message. 상기 제1 또는 제2긴급 메시지의 전송은 상기 설정된 반복 횟수에 의해 반복 전송됨을 특징으로 하는 긴급 호출 제어 방법. The first or second transmission of the emergency message, the emergency call control method, characterized in that the repeatedly transmitted by the set number of iterations. 상기 하나 이상의 긴급 메시지 수신처는, 기 저장된 전화번호를 검색하여 상기 가입자에 의해 선택된 소정 전화번호임을 특징으로 하는 긴급 호출 제어 방법. Emergency call control method characterized in that said at least one emergency message, the destination is pre-stored telephone numbers to a predetermined number selected by the subscriber. 상기 하나 이상의 긴급 메시지 수신처는, 상기 가입자로부터 직접 입력됨을 특징으로 하는 긴급 호출 제어 방법. The one or more urgent message recipient, the urgent call control method characterized in that a direct input from the subscriber. 상기 제1 및 제2긴급 메시지의 내용은, 기 저장된 긴급 메시지 내용들 중 상기 가입자에 의해 선택된 긴급 메시지 내용임을 특징으로 하는 긴급 호출 제어 방법. Emergency call control method characterized in that the first and second information, the emergency message, the emergency message selected by the subscriber group of the emergency message content stored information. 상기 제1 및 제2긴급 메시지의 내용은, 상기 가입자로부터의 직접 입력됨을 특징으로 하는 긴급 호출 제어 방법. The contents of the first and second emergency message, the emergency call control method characterized in that a direct input from the subscriber. 상기 판단 결과, 상기 착신호가 상기 긴급메시지 수신처가 아닌 다른 발신처부터의 착신호이면 착신 알림 없이 통화를 거부하고, 상기 발신처에 상기 가입자의 긴급 상황을 알리는 자동응답 메시지를 전송하는 과정을 더 포함함을 특징으로 하는 긴급 호출 제어 방법. A result of the judgment, further comprising the step in which the incoming call is rejected calls incoming call if no incoming call notification from the other the source rather than the urgent message destination, and sends an automatic response message indicating an emergency situation of the subscriber to the said source emergency call control method according to claim.